The fun and chaos of a European Endurance Championship! Steph misses one of her flights due to insane security lines in London-Gatwick, there is no rent-a-car place at the airport that I rented a car from, I call the hotel and they have shuttle, and then they don't have a shuttle, the new hotel is so far out the taxi service is not quite sure how to get there or what to charge. I finally get to the hotel, throw everything all over mine and Steph's room (she will think a tornado hit), grab my gear, take another looooooooooong taxi ride to the venue (later one of the Swiss team said, “I think your taxi driver was just driving you in biiiiiiiiiiiiiig circles, for fun!”), and once I'm there I realize I have forgotten some of my equipment. But that's okay, because I'm here! On the grounds of Companhia das Lezírias, site of the 2007 FEI European Endurance Championship and Open Portugal 2007 Qatar Challenge. The first people I happen to see are my team of Dutch friends, their horses having just arrived on the grounds after staying a few days on some nearby polo grounds. The riders and crews got to stay there too: “Oh, it was dreadful,” said Eric Lamsma. “Swimming pool,” said Charles Linneweaver. “Jacuzzis,” said Marc Van Wijk. Kind of makes you feel sorry for the lot of them, being put up in such a place. It's warm and windy and dusty here. Maggie McGuire, here with the British team, said the trail will be tough, especially the first two loops. 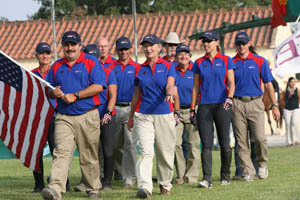 “Very stony.” The British have some strong horse-rider teams, including Christine Yeoman and her gelding Farouk De Lozelle (I met her in France this summer, at Stephane Chazel's), and young Fiona Hamilton and Sharifah, previously riding as a junior, in her first open European Championship. 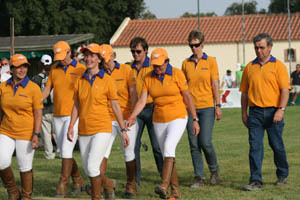 “Hard ground and deep sand,” said members of the Swiss team. And the heat and sun will take a toll on many, with temperatures now looking to be around 90*. 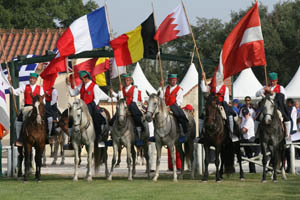 The Parade Presentation of Teams began at 6 PM, with a traditionally dressed rider on an Andalusian or Lusitano carrying the flag of each nation and leading the team riders and grooms and coaches into the grassy arena in front of a small crowd of enthusaistic people. There are 89 riders from 20 nations on the list of definitive entries. Steph had arrived in Lisbon somewhere around this time, but she spent the next few hours driving around totally lost. 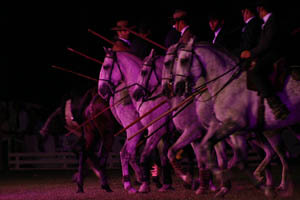 Meanwhile, an equestrian show began at 9:00 PM, a stunning display of horsemanship and equine athleticism. 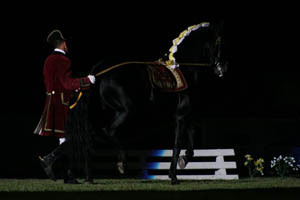 With great music – recorded and live Portuguese folk musicians and singers and dancers, the best riders of the Portuguese Traditional Equitation and the European and World Champions of Working Equitation performed in an arena under theatrical lighting. 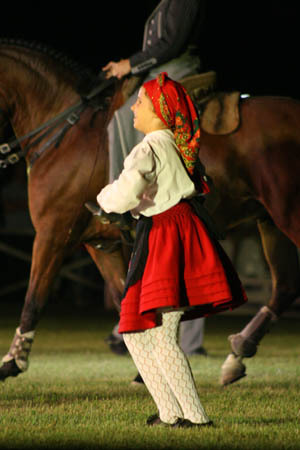 Leaping, pirouetting, dancing horses, single horses and groups of eight, horses and cattle, displaying traditional skills in working with a herd of cows. One of the most marvelous performances by one of the Andalusians was slowly cantering in a small circle, changing leads with every stride, with the rider holding his hat in one hand and a cattle-herding stick in the other. Wow and wow. Just watching the riders you couldn't help but wonder how many years and years of practice and study they've done to get to this point. Steph finally arrived right as the last horse walked out of the arena. Then began our epic journey home – we only took a few wrong turns on the highways (and you have to pay the tolls even if you do take the wrong direction!). It's late... my goal is to be in bed by 3 AM. We'll be up early tomorrow; the vetting in begins at 10 AM.